Jodi Curtin, a senior at Queen of Peace High School, was recently awarded the $20,000 HEAR (Health, Education and Relief) Foundation Scholarship that she will take with her to the Illinois Institute of Technology this fall. “I was so surprised when I saw Dr. [Raymond] Pollina in the cafeteria holding the check. I was, and still am, so grateful for the opportunity. I am honored to be part of such a charitable and generous organization,” said Curtin. The HEAR Foundation Scholarship is awarded to students who apply and meet the required criteria which includes exemplary character, academic excellence and a need for financial assistance for college. Curtin has a 4.1 grade point average and is a member of the National Honor Society, Mu Alpha Theta (Mathematics Honor Society), French National Honor Society, Math team, Student Council, Peace Ambassadors, Amity newspaper staff and is a St. Catherine of Siena Scholar presenting research on the availability of life-saving medication. Scholarship Director, Dr. Raymond Pollina, calls each student weekly and hosts holiday and summer events to stay connected with the scholars. Dr. Pollina is delighted to be able to provide this opportunity to students and understands first-hand how an opportunity like this can be life changing, “Doing this for others is selfish. It’s a joy. I was that kid. I got a scholarship and it helped,” he said. 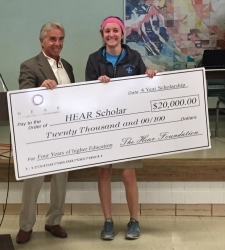 Dr. Raymond Pollina from the HEAR Foundation awarding Jodi Curtin with a $20,000 college scholarship.